HomeHello World! Let’s all remember the 50 State Governors have various elements of a National Guard that work for them…. Hello World! Let’s all remember the 50 State Governors have various elements of a National Guard that work for them…. Good Day, this is “Your Radiation This Week” for the past 2 weeks. These are the Recorded Beta and Gamma Combined Radiation Highs that affected people around the United States. YRTW is published every two weeks on Saturday. The next publication dates are January 14 and January 28, 2017. From December 17 to December 28, 2016 the deadly nuclear radiation decreased all across the United States. Only 36 American cities recorded Rad Reading greater than 1,000 CPM. It happened because most of the 104 nuclear power plants in the States were turned down to an idle or Switched Off. Thousands of businesses, schools and other institutions either Closed or were running a partial schedule so that the expensive, dirty electricity from nuclear power plants was simply not necessary. The utilities used cheaper renewable electricity instead. As the Rad leaking nukes were shut down or run with a light throttle the deadly Radiation in the air plummeted, too. 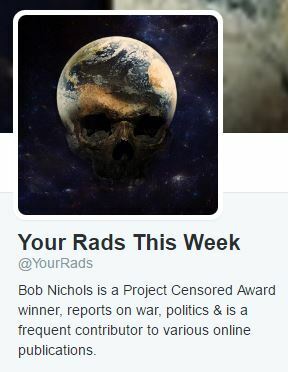 All across the country the Rad was down. HALLELUJAH! All was getting better… if even for a while; 11 days to be exact. Then the Nuke boys let the hammer down on Dec 28, 2016 and started powering up the nukes as electricity demand increased. The more nuke power plants there are running hot; the more these brittle old Wignerized(16) rattletraps leak Rad like a sieve. By December 30, 2016 49 American cities with Rad Monitors were recording Rad Readings over 1,000 CPM. The writing on the wall is clear; All nuclear power plants must be closed immediately. The Nuclear Industry people are murdering their neighbors – plain and simple. Let’s all remember the 50 State Governors have various elements of a National Guard that work for them. As such, they have enough force to enter the killer nuclear compounds and assume control of local nuclear power plants under their health and safety as well as police powers. 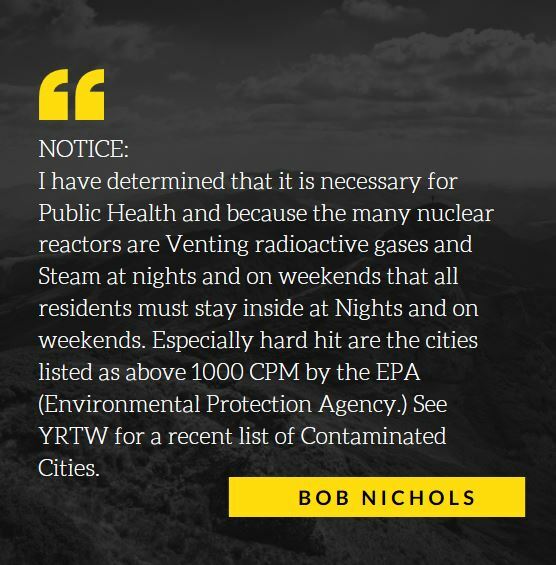 Read the entire article here, and check the Rads in cities nearest you.